Dentures have been around in some form for thousands of years. Over the centuries, they have evolved to become the comfortable, efficient dental prostheses that they are today. 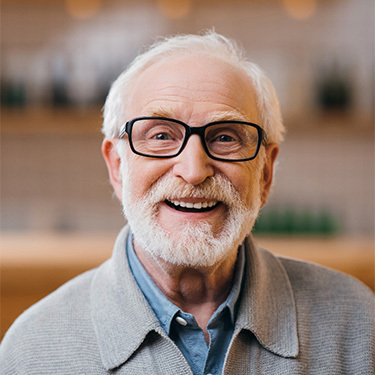 If you have suffered moderate to severe tooth loss, dentures may be the ideal way for you to regain your lost smile, prevent oral health problems, and once again enjoy all of your favorite foods. Dr. Cofer is a denture expert, and he would be happy to help you take advantage of this remarkable treatment. A denture is a prosthesis that consists of artificial teeth (made either of acrylic or porcelain) that are attached to a gum-colored base. 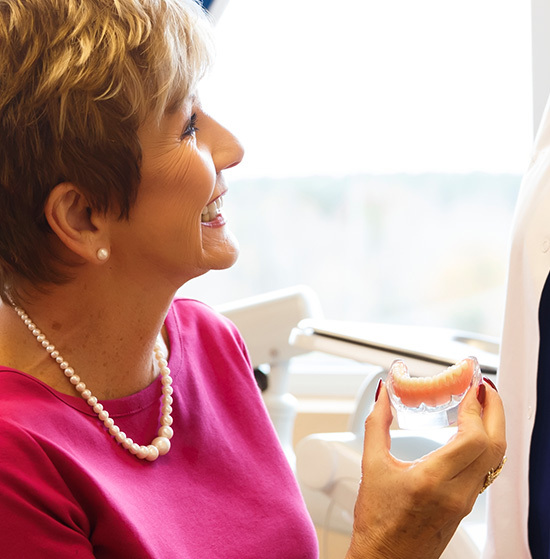 Each permanent denture is custom-made so it fits in perfectly with a patient’s mouth and provides them with a comfortable, well-aligned bite. Dentures, in some form or another, are a suitable treatment option for most people who have lost some, most, or all of their teeth. A full denture replaces an entire arch of teeth — either all of the top teeth or all of the bottom teeth. A traditional denture is secured in the mouth via natural suction or with the help of a mild adhesive. A partial denture is designed to replace multiple teeth throughout an arch, even if the missing teeth are not all adjacent to one another. This type of prosthesis may require metal clips or other attachments to help it stay securely in the mouth. Just like traditional full and partial dentures, an implant-retained denture provides partial or total tooth replacement. However, rather than relying on clips or natural suction to remain in the mouth, it is anchored in place via dental implants. The implants help to fortify the jawbone and enable the prosthesis to be as strong, comfortable, and natural-feeling as possible. This type of denture may either be removable or permanently fixed in place. Once you get used to using them, you will be able to enjoy most (if not all) of your favorite foods. As long as your dentures fit well, you can expect them to be quite comfortable and secure. Implant-retained dentures feel even better than their traditional counterparts. Caring for your dentures is easy. As long as you keep them clean, handle them carefully, and visit your dentist for regular checkups, you shouldn’t run into any problems with them. 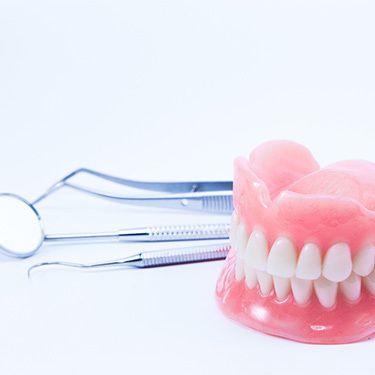 Traditional dentures may last for 5 – 8 years. Implant-retained dentures can last for decades. 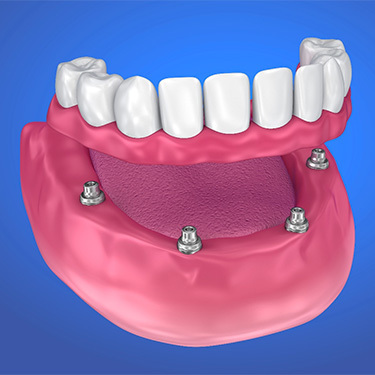 The cost of your prosthesis will depend on the type of denture you receive. Implant-retained prosthesis tend to cost more, but their superior longevity may make them a better investment. A full denture may cost more than a partial one. When you visit us for your restorative consultation, our team will give you an estimate for the cost of your treatment and help you explore your payment options. Many patients are qualified for low- or no-interest financing on major dental work, including dentures. 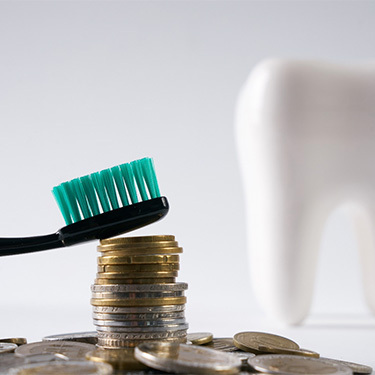 Dental insurance may also help you afford your new smile.